We don't just love retro games but indie games as well, and so it's time to mention Benal's Adventure Platformer ' Super Skelemania ', which wasn't just a Steam Greenlight success but has since been released via Gamejolt and Steam! This game that was teased some time ago as a demo puts you in control of a rather frantic skeleton, with some seriously cool moves, such as diving, rolling and even the ability to extend and skull bash! 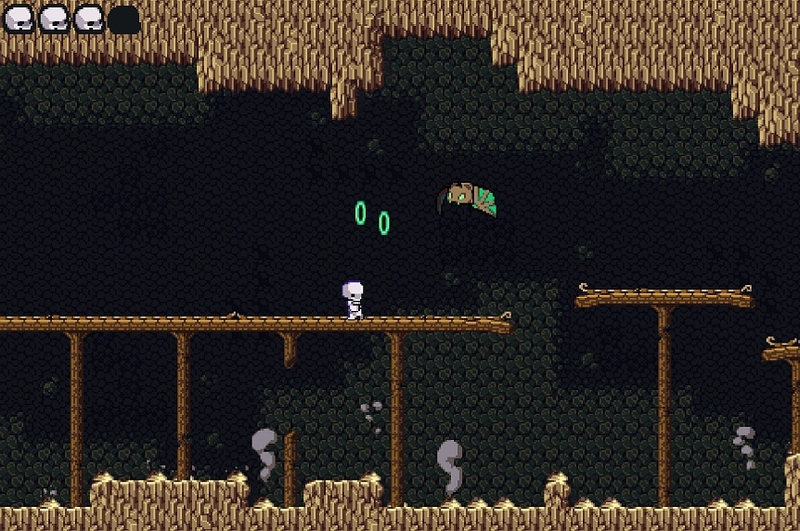 In 2015 we mentioned Benal's previous free game of ' Skelemania ' in which your skeleton character could dive, back flip, triple jump and wall jump through many different rooms avoiding deadly traps while also having the ability to roll his skull through some of the levels. This new game by the same developer once again gives you the opportunity to explore and survive through a colourful and lively underground world as a Cave Story metroidvanian mix. It again features detailed levels, enemies to fight, smooth animation, deadly traps and lots more that should be enough to keep you going through the week!